The last time these 2 clubs met was 3 weeks ago in the William Hill Scottish Cup when Annan ran out comfortable 4-1 victors, there was however to be no repeat this time with Berwick Rangers in the main being denied a victory by the goalkeeping of Jordan Hart who pulled off a string of superb saves throughout the match to keep Annan in with a chance and it took a stunning strike by Stuart McColm in the 82nd minute to eventually decide the outcome of this match. Injuries and suspensions continue to hinder manager Jim Chapman’s selection options with Peter Wetherson, Bryan Gilfillan and on loan Motherwell player David Ferguson all ruled out. After going down to Elgin City the previous week the big question was how would Annan react to last weeks result. Well one thing was for sure they could not have faced a more difficult task against a determined Berwick team, no doubt out to prove a point to newly appointed manager John Coughlin and as a result the outcome was on a knife edge right up until the end. Annan started promisingly and within 5 minutes Josh Todd latched on to a penetrating through ball but Todd’s finish was disappointing with the shot wide of the target and to the keepers right hand side. The game was fairly even but in the 16th minute Hart had to be alert to Michael McKenna when he denied the striker with a save with his feet after Berwick’s neat play cut open the Annan defence down the right. Annan responded in the 20th minute when Ryan Finnie’s dangerous penetrating cross to the near post was headed over the bar by Flynn. As the game approached the half hour mark a penetrating Berwick build up down the left ended with McKenna’s fiercely driven cross being punched clear by the diving Annan keeper. Annan were finding it difficult to penetrate the well organised Berwick defence and as half time approached it was Berwick’s David Banjo who was presented with the best opportunity of the half when a well constructed move carved open the Annan defence but as Banjo homed in on goal Hart was alert to the danger saving at the feet of the Berwick player. It was the chance of the half but as half time approached Berwick kept pressing forward forcing a couple of corners before the referee blew for half time. Rabin Omar posed an immediate threat to the visitors at the start of the second half only to be denied by the alert Kevin Walker. Finn Graham weaved his way to the edge of the box finishing with a low shot which deflected off the outside of the post. Stuart McColm was introduced for Ryan Finnie in the 51st minute as the Annan boss tried to make his team more of a threat. Ex Annan striker Blair Henderson was given dressing down by the referee after a confrontation with Swinglehurst in the 54th minute. As the match approached the hour mark Stuart McColm finished a good run with a fine shot which was defelcted for a corner and McStay’s corner was placed on a sixpence for Martin McNiff who headed over the bar from inside the yard box. At the other end Hart pulled off the save of match when Lavery’s low inviting cross connected with Blair Henderson and once again the Annan keeper pulled off an instinctive save tipping Henderson’s net-bound effort over the bar. Greig Macdonad and Liam Park were introduced along with Ross Drummond as both managers made changes in an effort to win the game. 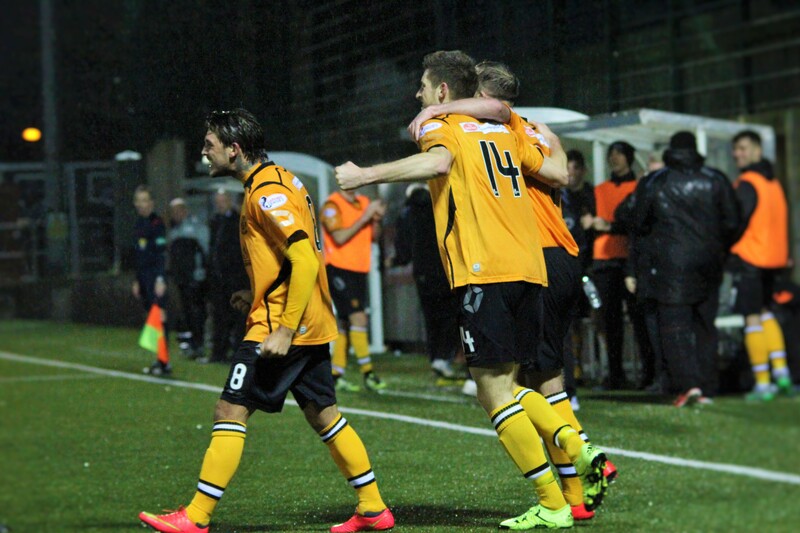 Annan were presented with a scoring opportunity in the 75th minute when Halkett upended Macdonald on the edge of the penalty box, Steven Black blasted the free kick high and wide and a rare scoring opportunity was lost for Annan. The deciding goal in the 82nd minute was special, the goal was created down the left , Greig Macdonald set up the opportunity after his precise pass between a couple of Berwick defenders was perfectly placed for the oncoming McColm who’s scorching shot from the corner of the penalty area ripped into the top corner of the net passed the outstretched arms of keeper Kevin Walker. It was a goal fitting to win any match but one Berwick will feel that was harsh on them. The Borderers pressed hard to the final whistle with shots from Beverage and McKenna testing Hart but no doubt it was Annan who were pleased to hear the final whistle in a match that they may look back on as a major contributor towards Annan’s quest to make the end of season play off places. Berwick Rangers did enough to get at least a share of the points from the game and were only denied in the main to the superb goalkeeping of Jordan hart. Annan boss Jim Chapman will reflect back on his teams ability to defend another clean sheet as a major contributor towards victory and the McColm goal maintained Annan’s record of having scored in every game they have played this season. After the match Annan player Matty Flynn was presented with the Ladbrokes player of the Month for October. 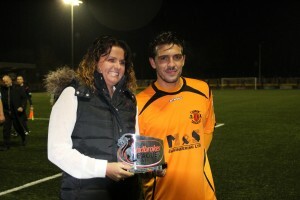 Flynn became the second Annan player to receive the Ladbrokes Player of the Month award after Smart Osadolor received the August award. ANNAN ATHLETIC: Jordan Hart, Steven Black, Steven Swinglehurst, Martin McNiff, Peter Watson, Steven Sloan ( Greig Macdonald 72 min), Ryan Finnie ( Stuart McColm 51 min), Matty Flynn, Ryan McStay (Liam Park 73 min) , Josh Todd, Rabin Omar . SUBS NOT USED: Blair Currie GK , Smart Osadolor, Scott Norman, Jamie Watson. BERWICK RANGERS :Kevin Walker, Ewan McNeil, Ross Drummond, Graeme Beverage, Steven Notman,Craig Halkett, Jonny Fairbairn, Darren Lavery, David Banjo ( Ross Drummond 74 min), Blair Henderson, Finn Graham, Michael McKenna. SUBS NOT USED: Andrew Russell, David Morris, Barry Hogg, Ross Graham, Robert Wilson, Mark Walters GK. REFEREE: David Lowe . Assistants Andrew McWilliam and David Ingram.